Parque Nacional Cotopaxi is Ecuador's most visited National Park, with one of the highest active volcanoes in the world at its centre. Volcán Cotopaxi, at 19,350ft (5,900m) above sea level, offers excellent hiking and climbing opportunities along with a small museum, a llama herd and camping and picnicking facilities. There is also a good chance of spotting condors and deer. An overnight mountain hut on the snow line is available for those wishing to climb the volcano. 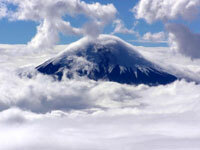 The recommended months for climbing Volcán Cotopaxi are December through April. However, travellers should always pay close attention to any alerts or warnings issued by authorities regarding volcanic activity. Those not interested in climbing the volcano will find picturesque walking trails around the lake at the bottom of the mountain, and there is a restaurant nearby for refreshment. Transport: Buses go to the park entrance (journey time is 1.5 hours), but it is better to arrange a guided trip from Quito. Pick-up trucks at the entrance are also available to take visitors to the car parking lot.